How effective is your influencer marketing? Have you defined your topics or keywords to identify your influencers? Do you use the number of social media followers as your main selection criteria for finding influencers? Have you segmented your influencers into categories such as Job Role, Location, Audience and Affinity? Have you identified your influencer community beyond your usual targets? Are you using a social platform to manage your influencers relationships? Are you aware of how your influencers consume and share content? Do you only engage with influencers when you're promoting something? Do you consider your influencers' interests when creating content? Effective influencer identification starts with the right topic. Select and group your list of topics into 1 or 2 main keyword search queries. What is it you want to be known for? Your chosen topic should clearly reflect either your product category, thought leadership topic, reputational issue or brand message. Brands typically have various different types of influencers who are all important to their reputation and market share. These influencer groups are often connected to (and influence) different audiences. Segmenting these different groups enables you to tailor your messages to different influencer groups. 50% of brands have identified their usual target (Tier 1) influencers but do not know who is influencing them from the wider community. If you are struggling to engage some of your core targets then it’s useful to connect with their top social media connections who they trust. Also identifying more niche subject matter experts (Tier 2) influencers can be an effective strategy as they are often easier to engage and will communicate your messages with a higher degree of passion and authenticity. Many brands are still using a combination of Excel and social media listening tools to manage their influencer relations activity. This creates a very time consuming manual process where influencers can soon be out of date and prevents you trying to scale your activity. An integral aspect to creating and sharing successful content, is understanding where your influencer community consume content and the type of content they enjoy. This enables you to create well aligned content that resonates with your influencers' interests, increasing their likelyhood to engage with and share your content with their own influencer community. Forming genuine relationships with the influencer community takes time and requires a long term view. The key to this process is regular and consistent engagement delivering value to the influencer and ensuring you do not sell to them! 56 million blog posts are shared every month, through WordPress alone. In order for your influencer community to engage with your content, it needs to be authentic, relevant and interesting. At Onalytica we help you engage with the inner circle of influencers to more effectively influence your end target audience. There are plenty of social media tools that can help you target as many people as possible. Onalytica helps you target the right influencers, at the right time with the right content. Whether you’re looking to run a single campaign, target the right influencers at an event or incorporate best practice IR into your wider comms, we’ll help you fix the things that will get you achieving success. Identify the most relevant social media influencers from our global database of over 100,000 influencers. Map which influencers are the key connectors and most influential within your community. Track what your influencers are saying to understand what they care about and how best to engage with them. Engage, interact and develop relationships at scale with your key influencer targets. 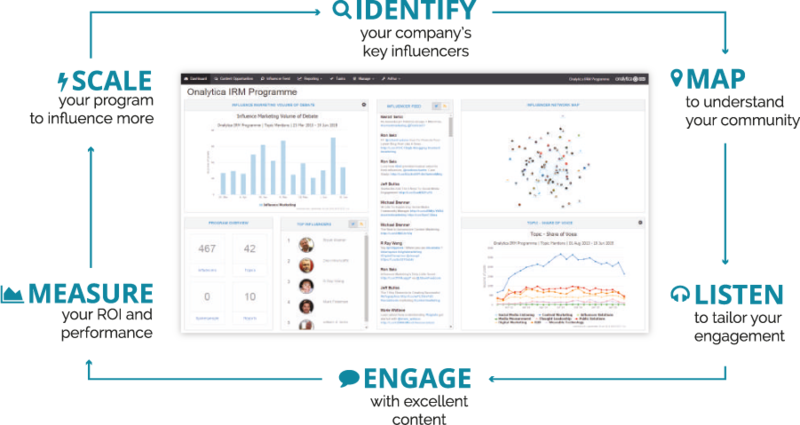 Access real-time insights from your influencer community and measure the impact of your influencer relations activity. Once your influencer program is delivering results the opportunity is to efficiently scale engagement with more influencers through light touch social outreach. Whether it’s just an introduction to the latest tech to help you identify your influencers, some support around topic choice or measurement, or a bespoke report – let’s talk.